Nowadays, Boba Drink has been a trend in culinary world in Indonesia, yes I can feel it, so many store opened in the last one year specialized in Boba Drink or let’s say Milk Tea Drink, actually this famous drinks are really well known as Taiwanese street snack and now they develop really well in Indonesia, most of the Brand is local not from Taiwan but can serve a super refreshment drink for us. So this is it Fat Straw ! Yeah maybe last two weeks, I’ve been at Fat Straw, hmmm it’s not the first time I’ve been here, because this is one of my favorite hangout place in Kelapa Gading, but as they just opened in Gandaria City, I’m getting curious and wanna try their new branch. 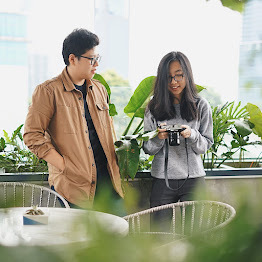 Fat Straw has quite well-known in Kelapa Gading and I think in Gandaria City they can become a serious competitors for another Boba Drink specialty, because Fat Straw has a really proper spot for everyone can sitting down here and enjoy their time. Fat Straw has an unique concept with cute bee icon as their brand, and when you order you’ll know why this is call Fat Straw because they’re literally “FAT” and that’s one of the reason why someone can sit down and do their hmmm maybe work-sheet for a long time, let me reveal it later, talking about the interior, you’ll feel like you’re in beehive and there’s a lot of cute ornaments. This is the signature of Fat Straw ! See the bottle, it’s Fat right?? I think you can share it up to hmmm 3 persons? But when you strat sipping it you’ll change your mind and don’t want to share it with nobody because you want to enjoy it yourself, because that’s what happened to me LOL ! I really like their rich milky taste, a real milky drink and the caramel also coffee jelly give some aroma, last their honey boba so chewy and give a unique sensation. Must try ! As a coffee addict, I think it’s too sweet because the milk overpowering the coffee but I can’t take it seriously, because they coffee just to add some coffee sensation not as the strong point, they more concern with the milk and boba, but when you compare to another store I think their coffee is so much better and the coffee jelly made it stronger. Here’s one of my favorite, Black Magic Milk Tea, usually I just can taste the milk on milk tea, but here the tea was dominating and this is what I’ve been looking for a milk tea, strong flavor of tea without underestimating the milk, so it become a really great milk tea, combined with Fat Straw home made boba, it become a must have item here, anyone this is the regular size. It’s quite different because contained no cream at all, a fresh kumquat juice ! if you don’t know about kumquat you can google it HAHA just kidding, kumquat is a fruit that have a high level of acidity and usually consume as herbal drink, taste really sour and fresh, but here they’re not putting the kumquat inside the drink, well I recommend you to add Lychee jelly as the topping, because the sweetness of lychee jelly can neutralized the sourness of it’s kumquat. Another good companion for your afternoon chill out with some friends, I think I don’t need to mention what churros is because it’s already well known nowadays, actually nothing special about the churros, no dipping sauce for it and I believe if they give chocolate or matcha dipping it will be a stunning dish ! Fat Straw not just offer you a light bites, now they also have a main course called Fat Rice, basically this is a rice bowl with sautee chicken and sunny side up, simply delicious, the chicken was quite generous and well seasoning, the sweet is quite dominating and if you like spicy and hot taste you can request for that, good to try. This is a unique twist !! I bet each of you have ever eaten Toast and of course Boba, but how it works when they mixed ??? I have no idea, but if you curious you have to come here and try the sensation, in my first bite it feel strange, but it’s like calling you to eat them again and finally I can find a fantastic experience enjoying this Boba Pocket Toast, crispy outside and chewy inside, the taste is like honey because they use honey boba as the filling ! Another dessert selection from fat straw called Fat Lover, hmmm maybe it’s quite fatty and milky, contains a lot of red bean, fat ball which is like Q ball in Taiwanese dessert or in Indonesia we usually call it “biji salak” and then egg pudding, honey boba and of course vanilla ice cream as the last touch, oh yeah they also using fresh milk to make it more watery, actually it’s not to sweet for me before mix it with ice cream. Well, I highly recommend Fat Straw for you who looking for a spot that you can enjoy your time while sipping delicious boba drink and of course to enjoy your sweet time with sweet dessert, the price tagged here is really affordable and a little tips you better buy the large one because it’s so much cheaper and absolutely more cute, happy Saturday everyone !